Christy told me the 2-pawed, fur-less animals are people. People seem to ask me LOTS of stuff. Maybe they ask me lots of questions since they hear I’m a smart boy? I’m smart because I’ve been listening to my trainers (those are dog teachers), studying, learning, and trying to do my best since I was a young pup. So for all you children out there, listen to your teachers and parents and keep up your good work with your studies so you can be smart like me! To help you learn, I thought I’d answer some of the most common questions asked of me. I hope you like it as much as a yummy bone treat! What type of a service dog are you? I’m a mobility and medical alert dog. There are different types of service dogs ~ guide dogs, hearing dogs, mobility dogs, seizure alert dogs, psychiatry dogs, autism dogs, and other medical alert/response dogs. There are different sizes of service dogs too ~ little, medium, big, and extra-big. 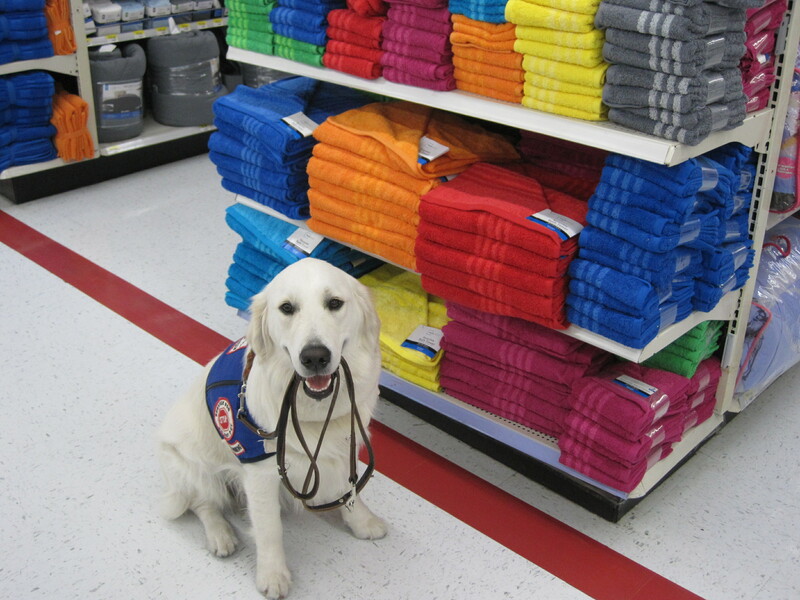 What are some of the tasks you do at HOME as a service dog? I can pick things up that are down too low for Christy to get, such as her shoes from the closet floor if it’s a day where she has a harder time moving. I turn on/off light switches, open/close difficult doors, open/close cabinets, push/pull drawers in or out, carry grocery bags from the store to the car to the house, and help do her laundry too! I’ll “Get a Drink” from the fridge, but I’m still working to remember to CLOSE the fridge door after I get Christy some water. Practice makes perfect, right? I also wear my gear because my patches help Christy. 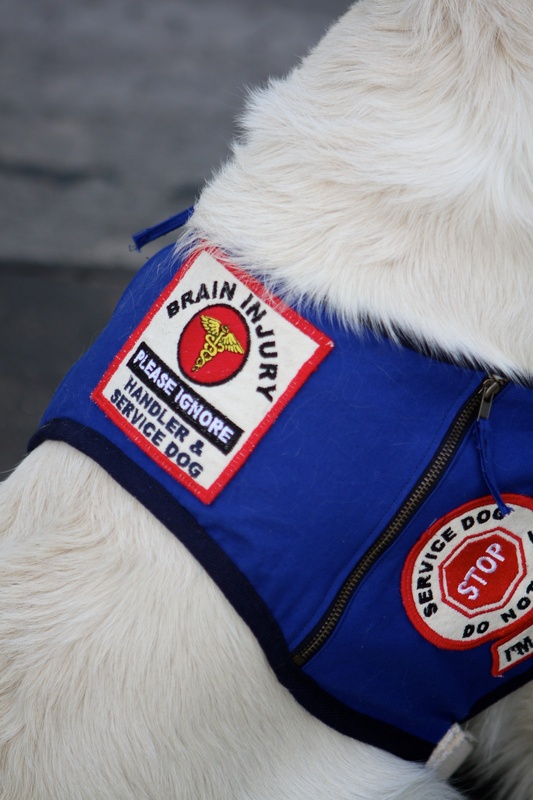 One patch reads “BRAIN INJURY: PLEASE IGNORE HANDLER AND SERVICE DOG.” This patch helps Christy because she can point to it when people ask questions which frequently overwhelm her. In her heart, she’d love to talk and educate, but it’s not physically possible for her. My gear also communicates “DO NOT PET” or “DO NOT DISTRACT” me. Sometimes people think I’m a walking petting zoo, but I’m working and it’s a serious job to be a service dog. I have to stay FOCUSED so that I keep Christy safe and out of danger. I would not like if I missed a medical alert because I was distracted by someone trying to pet me. I would not like if I made Christy fall because I veered toward someone who was making kissing noises at me. I’m working to ignore people even though I love them. If you see me in public, please help me do my job safely ~ do not call my name, pet, talk to, bark, or make other odd noises. Shoes! You wear shoes! You wear shoes? Why do you wear shoes? These are my dancing shoes! I’m not too happy standing still to get my shoes on, but once they’re on I just LOVE to DANCE, PRANCE, and WIGGLE-PLAY in them. Christy usually has to remind me to stop playing becuase it’s time to work. I do look dapper in my shoes, don’t you think? I wear shoes when it is really hot outside. Originally, I was trained in Kansas during the winter months and I loved having cold feet in the snow. When I arrived here in warmer climate, I didn’t like to walk on warm – not hot – ground. I was so bothered by warm asphalt that I couldn’t concentrate on helping Christy. So, the shoes help me stay cool on my footsies and then I can concentrate on my job! Many service dogs, search and rescue dogs, and even pets who are going out for long hikes or other activities wear shoes for heat/cold protection. My shoes are Bark’n Boots from http://www.ruffwear.com/. It sounds like you’re a very busy boy! Do you ever get to play and just “be a dog?” Apparently, there’s something called a “Marley?” I hear Christy tell me this when I get home from working in public and I’m released to play, play, play! I don’t understand this “Marley” reference though because I’m SIR WINDSOR B. DERBY! With that said, why don’t you watch my next video? Then you can decide if I ever get to Grrrruff-house! Is there a difference between a mobility dog’s harness and a guide dog’s harness? 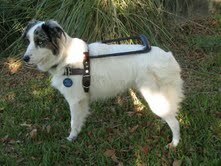 Somedays, I work in my mobility harness from Bold Lead Designs. 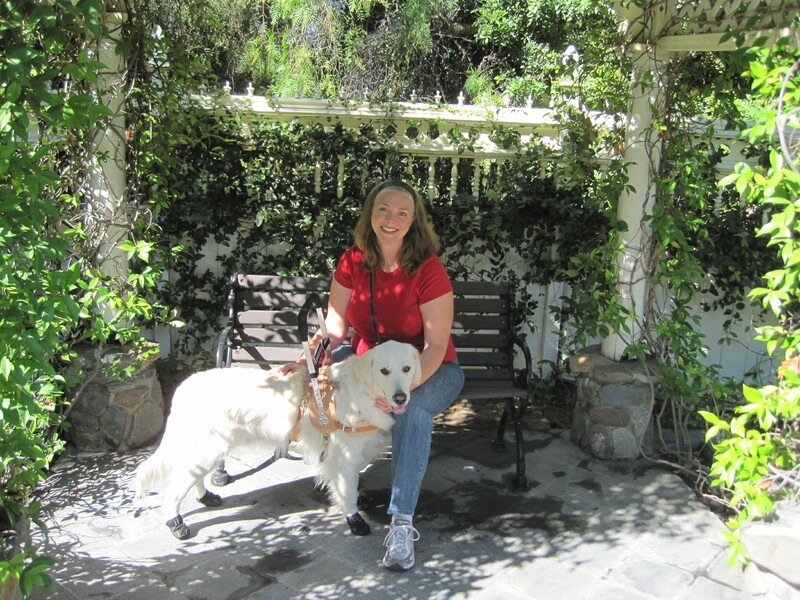 Christy and I began mobility harness training in October 2010. People sometimes get confused and think I’m a guide dog when I wear my mobility harness and Christy wears her dark glasses due to her eye sensitivities to light. The mobility harness and the guide harness have ways in which they are ALIKE and ways in which they are DIFFERENT. Here is a picture of me in my mobility harness and one of my good friend, Boris Taylor, in his guide harness. STRUCTURE: A mobility dog harness and a guide dog harness must each be designed to protect the dog’s structure and be light-weight. My mobility harness weighs less than 2.5 lbs. A mobility harness IS NOT designed for the dog to take a person’s full body weight. A guide harness is not designed to take a person’s body weight at all. Both the handle on the mobility harness and on the guide harness are rigid, stiff under the handler’s hand. 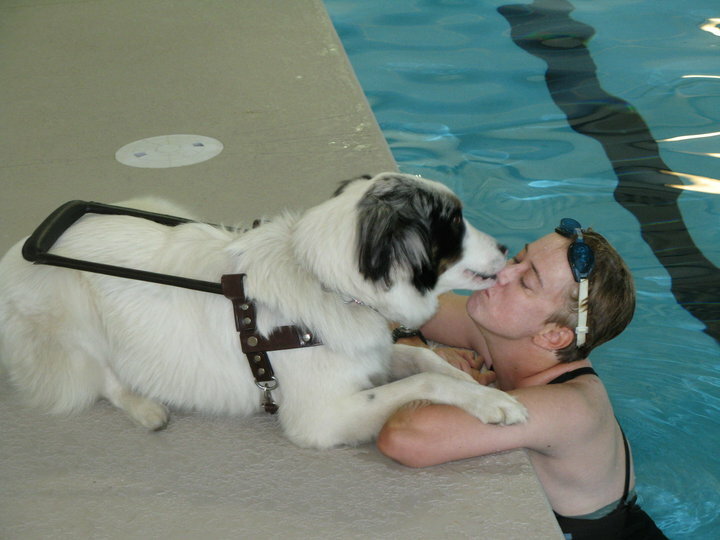 PURPOSE: The mobility dog harness is to help provide light support for stability and balance to the handler. A mobility harness is NOT designed for pulling nor guiding. The guide dog harness IS designed for pulling as the dog leads his/her handler via a controlled pull through the harness. My mobility harness may help with some pulling because a pull strap may be added to the lower back part of the harness, but I am NOT to pull Christy while she holds onto the handle. 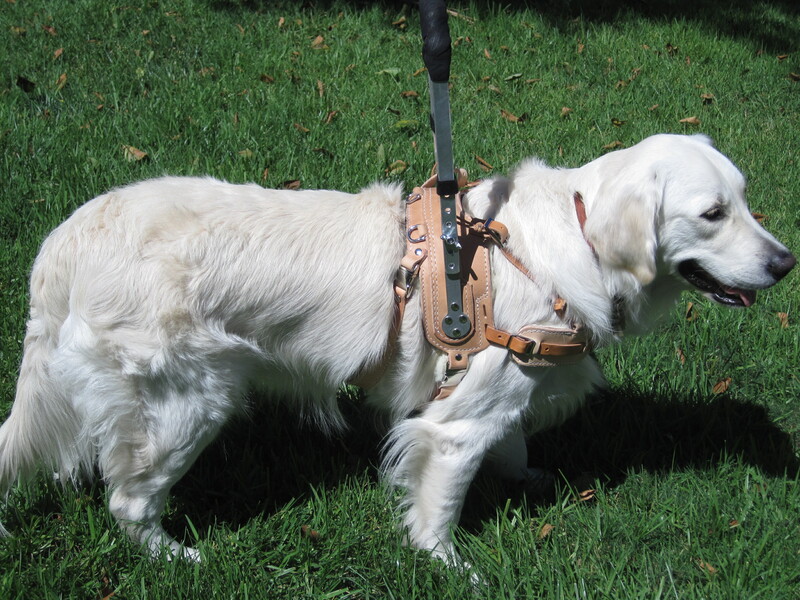 HANDLE POSITION WHEN IN USE: The handle on a mobility dog’s harness should be in a straight, stiff, up-right position in order to provide balance/stability support and should be over the shoulder area of the dog’s body. The handle on a guide dog’s harness goes into the needed “up and away” angled position when the handler picks the handle up off the guide dog’s back. Both the mobility harness handle and the guide harness handle need to be within a comfortable reach for the handler’s hand. 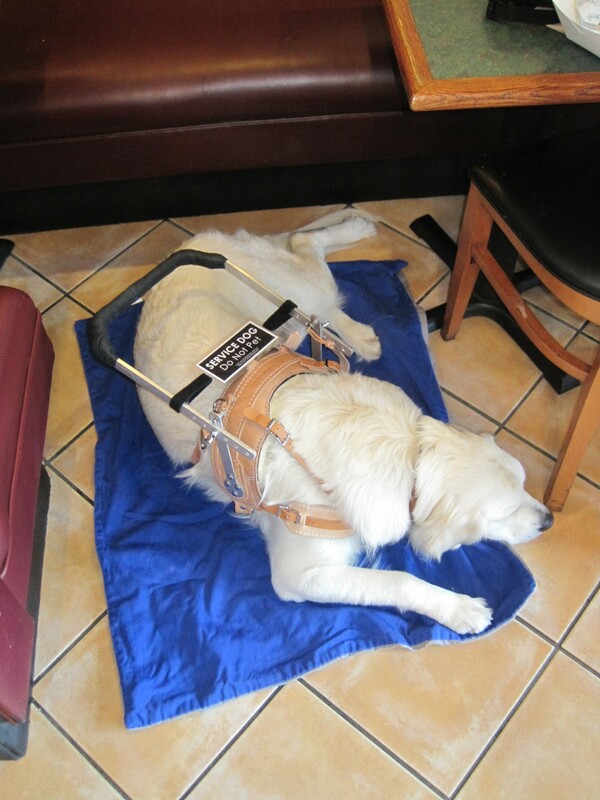 We service dogs “service” or help a person who is disabled. A disabled person is still an “ABLE” person. 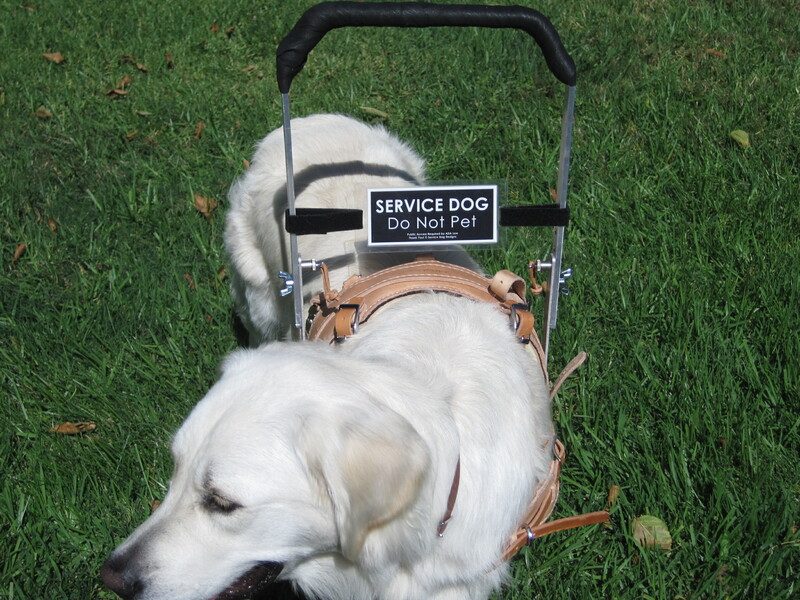 A service dog performs functions and tasks that the disabled person is unable to do or has difficulty doing for him or herself. The disabled person who works with the service dog is called the “handler.” I, as a service dog, am protected under the “Americans Disability Act” (ADA). The ADA is a law that protects the disabled handler and their service dog, so they may enter any public business, even restaurants. A therapy dog is trained to provide affection and comfort to people in hospitals, retirement homes, nursing homes, schools, with people with learning difficulties and stressful situations such as disaster areas (from Wikipedia). A therapy dog is not protected by the ADA and does not have the right to go out into public places other than where it provides therapy to people. Although we receive alot of love and praise, service dogs are NOT pets, nor are we therapy dogs. Service animals spend months (typically 18-24 months) and many hours training in order to perform his/her tasks safely and properly without being a disturbance in public and to enhance a disabled person’s life. It is against the law for people to “pass” their pet off as a service animal. It is not only illegal to be a “faker,” but it is also disrespectful to all who are truly disabled and to everyone who has worked for disability rights. How should I approach you or another service dog? Most importantly, “DO NOT PET” and “DO NOT DISTRACT” us from our job. Do not call the service dog’s name, pet, talk to, bark, or make other odd noises at him/her. Please understand the handler may not be able to stop and talk due to their own limited time schedule or physical limitations. Please, take NO PICTURES OR VIDEO without asking the handler. For Christy, it can be DANGEROUS for someone to take our picture or video. It can cause a serious medical crisis if she does not have a certain medicine in her bloodstream. It is a medicine that can only be taken periodically in high doses, not daily. Do not approach a service dog team with a pet. Service dogs are NEVER allowed to play with other dogs while they are working. How have you been trained? At 2 months old, I went to Kansas for 7 months to train. While there, I passed the AKC Canine Good Citizen Test and the Public Access Test. It is not a legal requirement in the United States of America for a service dog to be certified, but I am certified via Paw Pals Assistance Dogs. Christy and I continue working with Wendi Okabayashi from A Heart for Paws Dog Training. ( http://www.aheart4paws.com/ ) With Wendi’s training, we have strengthened our skills, learned new tasks, learned proper techniques for mobility tasks/harness usage for my safety, as well as for Christy’s safety, and we enter public with other service dogs or service dogs in training. Why is your gear custom made and where do you get your gear from? My equipment costs are higher because of Christy’s special needs. Materials made from chemicals (polyester, nylon, rayon, etc.) or metals created with certain materials, cause Christy to stop breathing and her brain short circuits causing great physical stress. Christy likes to breathe and have fewer short circuits, so ALL my equipment must be made from natural materials – cotton, cotton thread, vegetable dyed leather, sheepskin, etc. 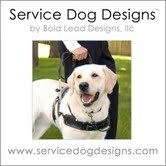 My equipment includes specialty collars, a variety of service dog leashes for mobility assistance, vests, patches, harnesses, etc. Many of my toys must be made from natural materials to pass Christy’s “breathing” test so she can play with me when I’m not working. These two companies have been wonderful helping Christy and me. My custom made collar, harness, and most leashes are from http://www.boldleaddesigns.bigcartel.com/. My custom made vests/patches are from http://www.servicedoghouse.com/. I told you, I know LOTS of stuff and am one smart boy because I’ve worked very hard at learning! That’s why I asked Christy if I could have MY OWN page on her blog. People should know about ME too! It’s been a thorough delight being a British professor today! Do I look the part in my debonaire bow-tie? I hope I did my title as Sir Windsor B. Derby great honor as I’ve enjoyed teaching, sharing some of my expertise as a service dog. 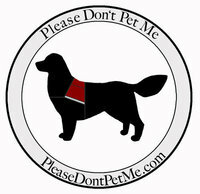 If you’d like to learn more about service dogs, I highly recommend you visit http://pleasedontpetme.com. You’ll see me there on the home page with Christy. 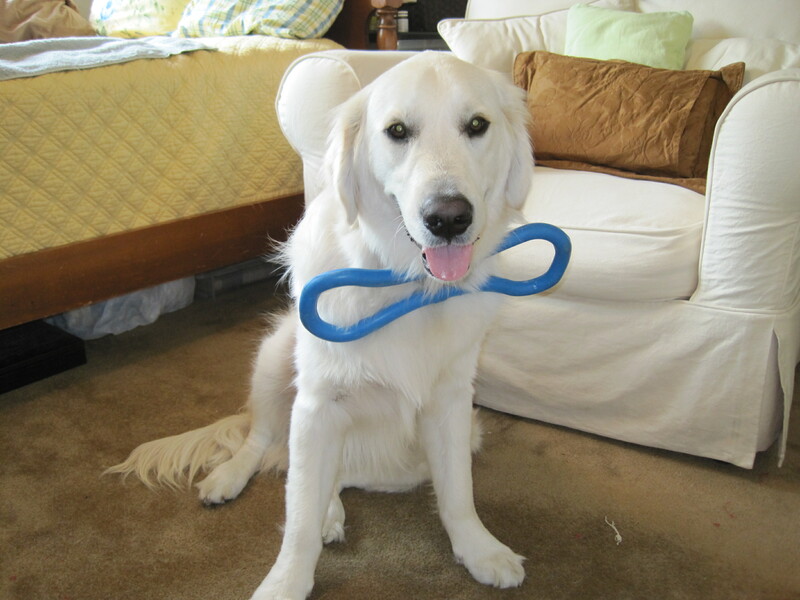 I am a member of the United States Service Dog Registry at http://www.usservicedogregistry.org/index.php. Christy carries my ID in her wallet. I also carry my ID card in my vests and will do so in the pouch which will soon be attached to my harness. The ID card shows people the laws regarding service dogs in businesses. It is not a legal requirement for a service dog team to carry ID, but in my opinion, it simplifies problems that may arise. I also have a ID card from http://servicedogtags.com/. It made my flight on the airplane to Christy much easier since it is an accepted form of service dog ID with major airlines, although, again it is not a legal requirement. The back of the card contains information from the Department of Justice that clearly answers common questions and provides a toll-free number to the D.O.J. should business owners or employees have further questions. In certain states (U.S.A.), including the one in which I live, if another dog attacks, hurts, and/or kills a service dog in public, the owner of that dog must pay for the veterinarian fees and/or a new service dog. Service dogs are protected similarly to law enforcement K9s and are granted the same protection. To learn more about disability rights, please visit http://www.ada.gov/. BRAVO, Christy & Sir Windsor! What an amazing and insightful blog entry with regards to Service Dogs (and Therapy Dogs) and what they do! I always learn so much from you and am looking forward to many, many more blog entries! That is beautiful, just an amazing job putting all that together. You have an incredible talent like my friend Karen Chaton. She’s a beautiful blogger queen as well. You’re so gifted! Windsor your page looks GREAT! Very informative and accurate! It seems you teach as well as you learn! You and Christy are an awesome team and we are so glad to be your friends! WAY TO GO!!!! WOOOOOO HOOOOO! YAY!!!!! YOU DID GOOD!!!! Your page is AWESOME!!!! OMG ! What a handsome Dog you are Sir Windsor :0-) What a beautiful couple the two of you make. I do know the importance of working K-9’s in Law Enforcement, Service and or Therapy Dogs,Military working Dogs. This is great to see what the two of you put together along with your friends to show everyone and make more people aware. Keep up the good work together and I look forward to seeing more about ya’ll !! Looks like you have been busy on your blog. Enjoyed reading Sir Windsor’s lessons. Great videos! Where did you get Windsor harness? Where did you get Windsor from? How old is Windsor. Christy what size boots dose Windsor wear? Could you do a video of how you put on, so they stay on. Then taking them off. Conner and I are on the process; of putting the boots and take them off. The Brand that I have is Mutllikus. 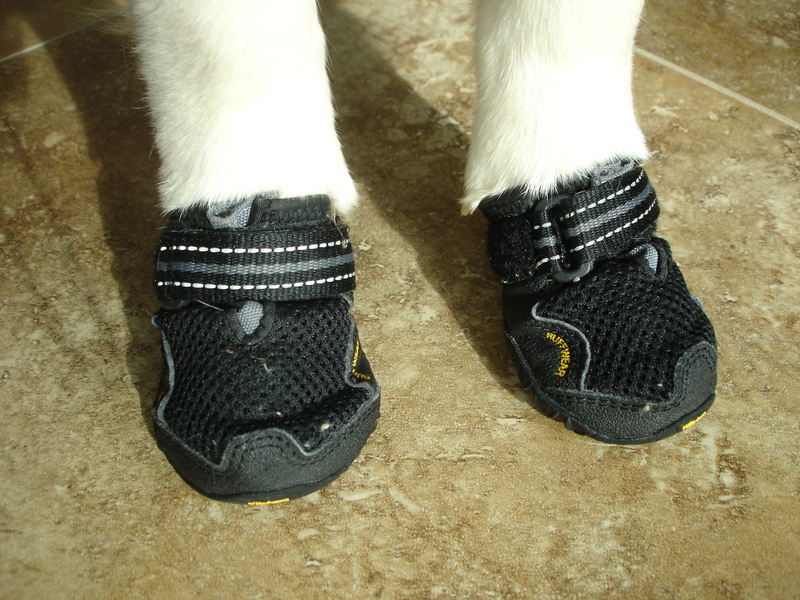 Windsor wears size SMALL in the old style boots and the new style boots from Ruffwear. His front paws measure 2.5″ across. Yes, we’ll be happy to make a video.